What is it about Angelenos that as soon as you put them behind the wheel of a car, they want to see how fast it will go? But it’s true. Great-grandpa was, in all likelihood, a speed demon and the old touring cars and horseless carriages that sputter down the street once a year in our Fourth of July parades seeming like frail survivors of the past were subjected to incredible punishment in what has to be the prenatal era of motor sports. Unfortunately, the Southern California Timing Association (founded in 1937) and the National Hot Rod Association (founded in 1951 at the Tam O’Shanter in Glendale) were not available to record what the cars turned in the quarter-mile or their time in going from 0 to 60 mph during the May 4-5 auto races at Agricultural Park, roughly in the area of Exposition Park and the Coliseum, staged as a fundraiser for improving California’s roads. (Actually, the time for 0-60 mph for most of the cars was: Never). It’s a little difficult to determine the composition of the track, although it might well have been nothing more than 2-by-4s laid on edge over a heavy wooden framework, a method used on a racetrack in Venice about the same period. In fact, we don’t even know the names of all the drivers, just the make of their cars and how and when they broke down. The 50-mile race, for cars selling in Los Angeles at $2,500 or more ($51,308.93 USD 2005), featured an Apperson owned by F.L. Hansen and driven by Wan Kuhl; a Cadillac driven by Lester Pattee; an Elmore with an unidentified driver; a Haynes with an unidentified driver; a Royal owned by Jim Morley and driven by Barney Oldfield; and a Thomas driven by J.R. Finletter. Although racing taxed the engines (Oldfield snapped the crankshaft in an exhibition race with Bruno Seibel’s Red Devil), the most vulnerable part of these cars was their tires. Without a long detour into the less than thrilling subject of wheel technology, autos of this era were equipped with 30- to 34-inch tires and inner tubes on a demonic device known as the demountable rim—and if you don’t know what that is, consider yourself lucky. The 25-mile point at 31:26:5 (47.70 mph); 30 miles at 37:48 (47.61 mph); and 35 miles at 44:09:5 (47.56 mph). Remember that some of these times were on steel rims. In a five-mile race between the Bruno Seibel’s Red Devil and Harris Hanshue’s Reo Bird, Seibel averaged 58.63 mph, finishing in 5:07:25. 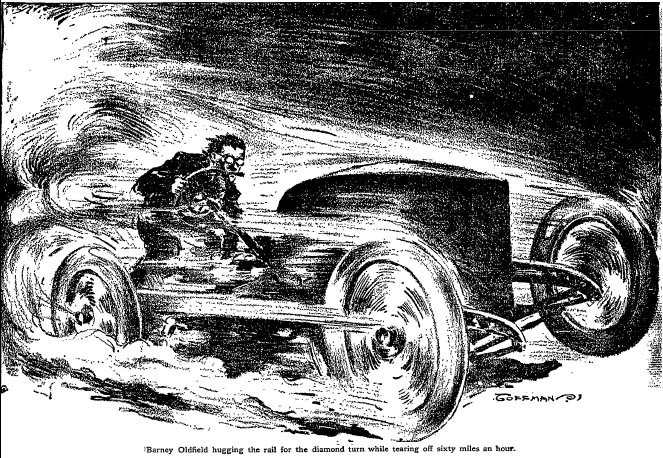 The top speed seems to have been reached by Oldfield, hitting 64.12 mph before a blown tire forced him to stop at the 7th mile of a 10-mile solo exhibition. 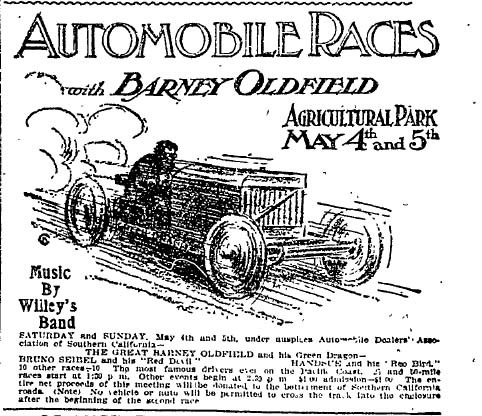 This entry was posted in 1907, LAPD, Sports, Transportation and tagged 1907, Barney Oldfield, Green Dragon, hotrods, Motorsports, NHRA, sports. Bookmark the permalink.